Creating an online waiver or converting your existing paper waiver into an online waiver is a fairly simple process. 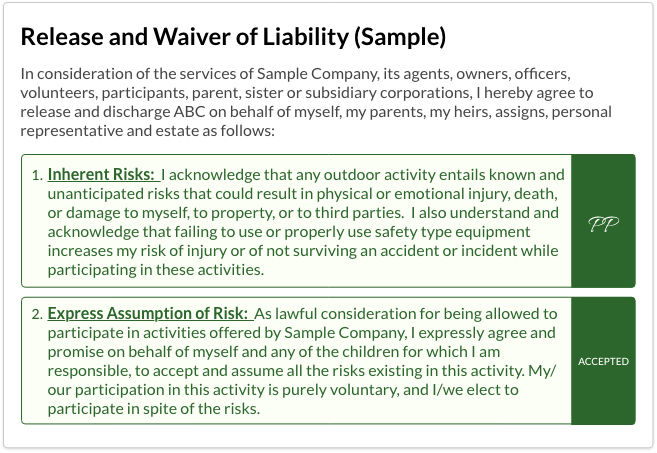 We walk you through the steps here and then give you some options to sign a sample waiver / release of liability online. Here are the steps you’d follow in WaiverSign to be up and running with your own online waiver. Simply setup, send, sign and store! Business Owner Becky creates her account on WaiverSign. 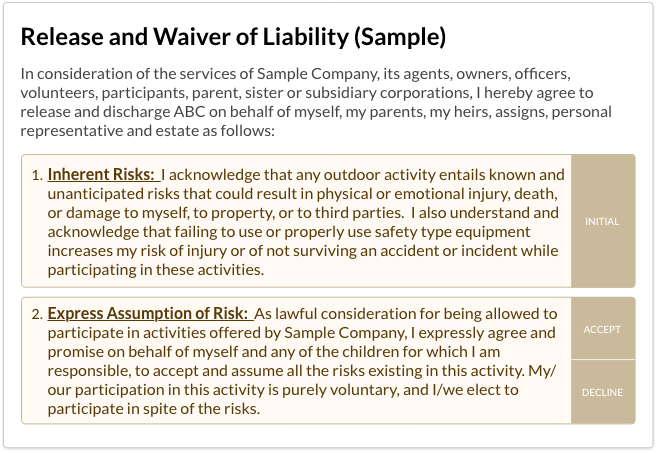 She has an existing Release of Liability Form that is fairly straightforward. She opens the document on her computer and copies and pastes the content into WaiverSign. Next, Becky chooses what information she wants to collect on her liability waiver. 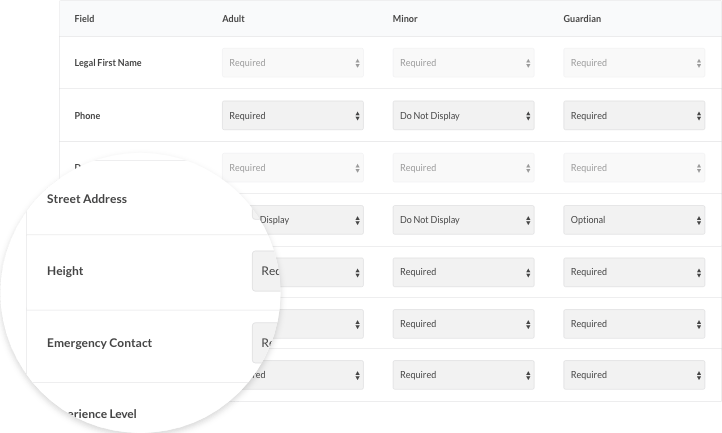 She has 16 standard fields to choose from, including name, address, phone, and date of birth, as well as custom fields that she can create to gather additional information. Becky then decides it would be a good idea to have her online waiver in both english and spanish since many of her participants are native spanish speakers. She toggles over to spanish and pastes in a version of the release form in spanish. 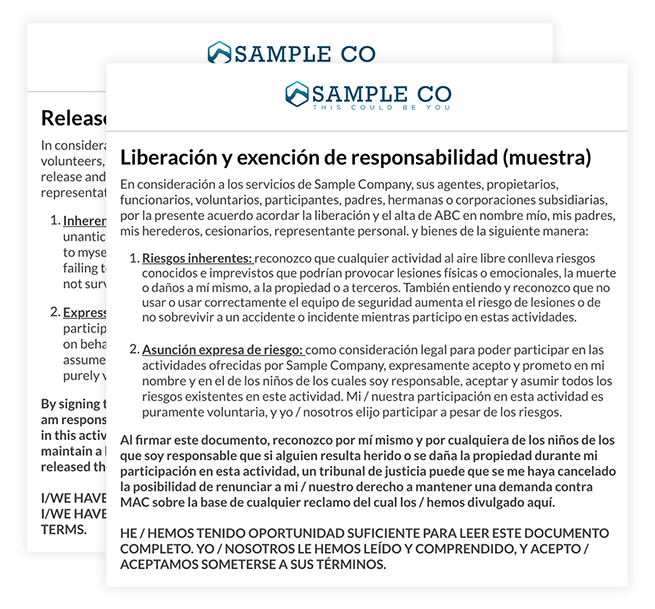 Becky knows this will help protect her if one of her participants claims that they couldn’t understand her Release of Liability Form in english. Now that Becky has everything set up, she is excited to collect her first electronic signature on her new online release form! Minutes later, she gets a call from Pamela Participant who is registering herself and her two boys, Peter and Paul. She sends off the confirmation email which is received by Pamela. Pamela clicks the link to sign the online release form and is walked through a few simple steps. 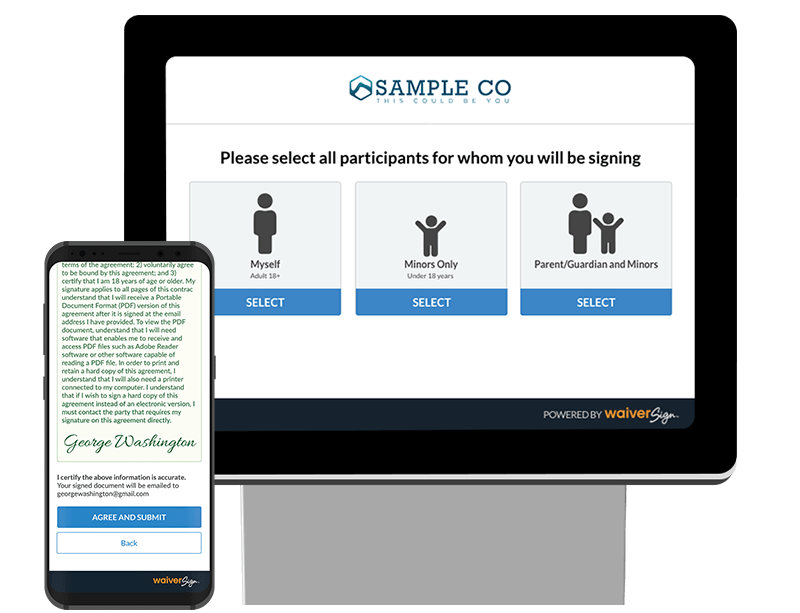 Want to demo signing an online release form? Meanwhile, Becky notices her email inbox is lighting up with some new messages. She just received confirmation of all 3 online release forms being signed! 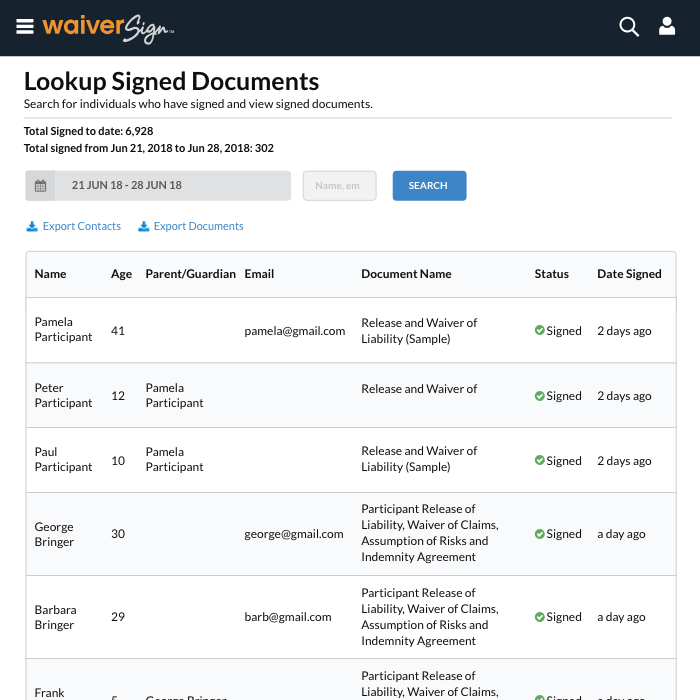 Excited to see how this looks inside WaiverSign, Becky goes to “View all Signed” in the application and sees the 3 forms that have been signed. She can click each one and view or print the signed release form if needed. 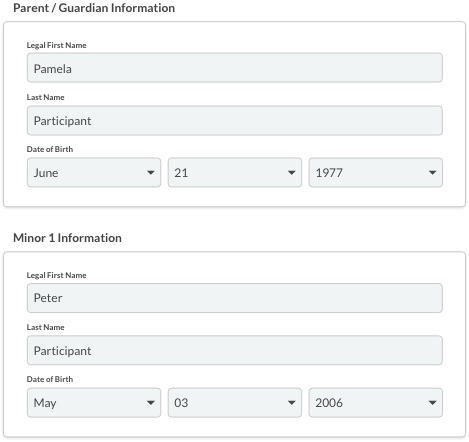 Becky also notices that Pamela is now added as a contact in WaiverSign with all her personal and demographic information stored. Becky is so happy she won’t have to collect paper waivers by hand and key in all the personal data (that she could barely read) into her marketing database. She can now see who has opted in to receive newsletters and add them to her email list with a simple export. Try out the signing process for yourself. Enter your email when asked and you will receive an example of the follow up email as well. Fill out this quick form and we’ll get you set up with your own WaiverSign Account. We’ll create your business account in WaiverSign. If you’ve provided a document, we’ll have it all set up in the system for you. We’ll walk through the process with you and answer all your questions. If you like what you see, we’ll add you as a user you’ll be on your way. Once you’ve filled out the form, you’ll get a call from our best and most knowledgeable WaiverSign success managers. They’ll walk you through the whole process and make sure you’re ready to go! "The team at WaiverSign has really delivered. I'm happy with the product and the level of support." Pamela selects that she will be signing for herself and 2 minors. She is happy to see that she won’t have to fill the form out 3 separate times. She reads the online waiver and verifies her information. She applies her initials where required and accepts the clause about helmets. Pamela then applies her signature and notes that an email will be sent to her with the signed document. She checks her email and sees that all three signed online release forms have been sent to her. 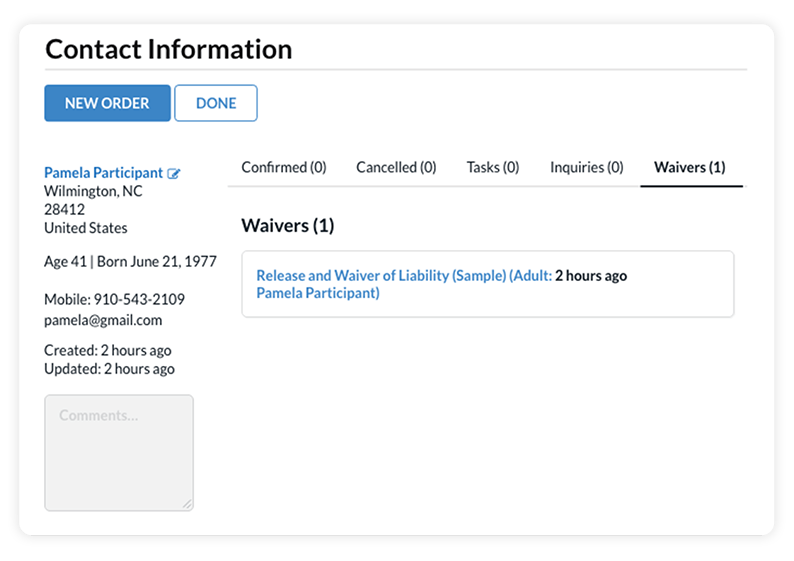 Pamela opens the signed release form and notes that each document is stored with an ip address, timestamp and document id. 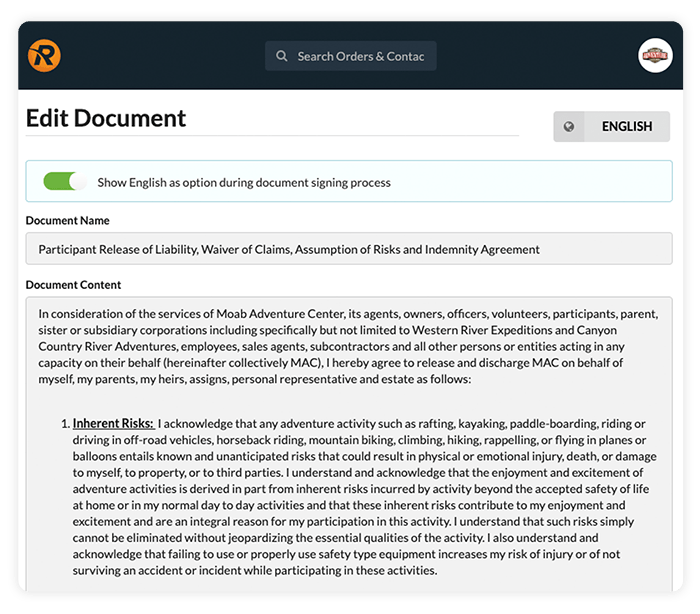 Sign a sample online waiver on your desktop, tablet or smartphone to see what your participants will experience with WaiverSign. 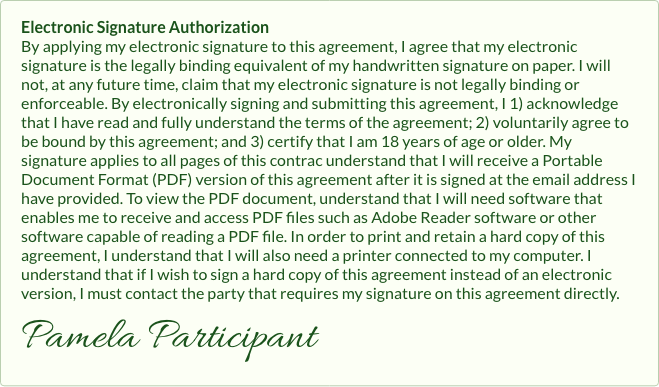 Your electronically-signed PDF waiver will be emailed to the address you provide during the signing process. 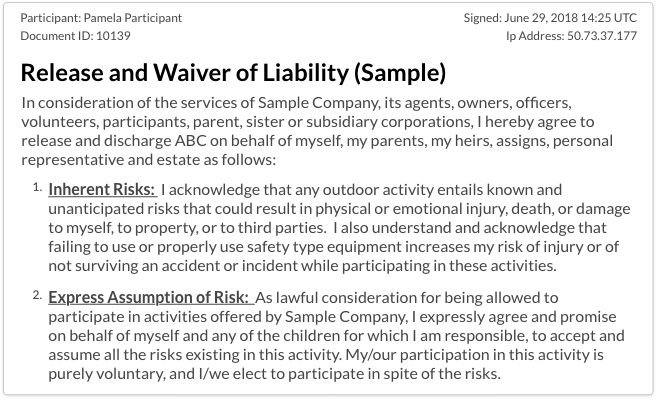 Example Waiver: The waiver content you'll see in this demo is presented only as an example.